It’s not the first and surely not last stadium opened before works end. But this one is in the global spotlight as opening venue of the World Cup in 24 days. Yesterday it saw its last, 8th test event. May 18 marks exactly one year since the opening of the new Estádio Nacional in Brasilia. And one year on the opening stadium of 2014 World Cup isn’t ready to host the tournament. 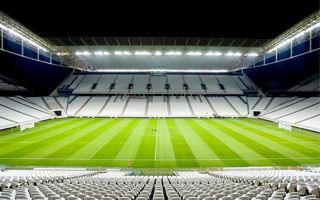 In fact, as the first game is just over three weeks away, heat surrounding the Itaquera-based Arena Corinthians is growing. Yesterday supporters saw their already 8th test-game. First came on May 1 and was open to a handful of fans, while workers played on the pitch. On May 10 20,000 seats were made available for a set of 6 exhibition games by past and current Corinthians players. Finally, yesterday almost all of the permanent sections at the stadium were available, reaching final attendance of 36,694 people. Catering for such a crowd at a stadium that’s still surrounded by construction zones forced extra precautions. Street traffic around Arena Corinthians was limited, while nearby subway and railway stations had special routes set for fans. Some of them, like the below temporary staircase, may be safe, but surely cannot be left to function longer. Access and moving around the stadium was facilitated by World Cup volunteers. Their help proved very useful as congestions were common at turnstiles (still waiting for FIFA-required metal detectors) or concession stands inside. Some facilities were closed, seeing only one in two elevators operate. As predicted beforehand, the individual seat numbers were not followed by fans across the stadium. Staff on site only executed taking the right seat at the most expensive western grandstand. Sunday weather showed a painful feature of the stadium, one mentioned already in 2011 as a potential problem. The roof, hanging high above spectators, hardly provided any cover to fans at the lower tier, who fled temporarily as rain went down during the game. Of course many spectators didn’t mind the glitches, focusing on how great the new stadium is overall. The overwhelming excitement and positive approach was, if at all, spoiled by Corinthians losing 0:1 to Figueirense and slipping behind derby rivals Sao Paulo in the league. On Friday Odebrecht, the general contractor, admitted roof works will not end in time for any World Cup game. Some of the secondary elements won’t be mounted as well as the entire glass part. This means a few thousand spectators in front rows on east and west sides will not be protected from the elements, even if such protection would have been arguable. Ironically, the uncovered seats will be among most expensive at the stadium. Though FIFA never required 100% coverage, this is still considered a shameful slip. Especially with Corinthians construction manager Andres Sanchez admitting both the investor and contractor left too many things until the last moment. Apart from the roof, works go on at the temporary north and south stands, as well as inside the western grandstand, where furnishings are now being installed. Similarly, the stadium is surrounded by construction equipment and lacks proper access routes. Apart from already mentioned temporary ramps there were also no street lights ready yesterday, forcing fans leaving the stadium in the evening to use cell phones to light their way out. Final construction delivery date remains unknown at this point and is hard to predict even more as the prosecution was considering halting works once more last week, seeing not all safety standards applied. Corinthians currently estimate, that the project will cost them 14-18% more than expected, reaching BRL 920-950 million ($415-428m / €303-313m). It’s still outstanding, isn’t it? While the delays exceed 5 months and we’re just days from opening of the FIFA tournament, it’s still without a doubt a great stadium. Its aesthetics caused a heated debate already as the first renderings were shown and calling it beautiful is a matter of taste. What’s hard to challenge, though, is that this stadium absolutely stands out among most modern arenas, often very derivative. This is reached by the overall design – with sharp, imposing forms and the hovering roof – but also by details. The stadium’s exterior is almost entirely white, whether it’s steel, composite panels, translucent glass or the very seats. This makes it seemingly light and elegant despite the strong shapes. Inside the whiteness is contrasted with black details, composing the striped colours of Corinthians. But of course the main enhancement are the fans. They’re the ones who will make this high-tech white giant a vibrant cauldron on gamedays. Though the club’s estimates of 30 million fans worldwide seem far-fetched, it’s absolutely true that few football teams can count on so many devoted supporters, who follow it everywhere, even if this means going to a different continent.